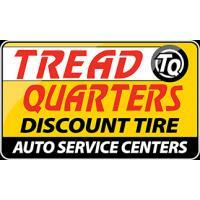 Tread Quarters Discount Tires and Auto Service Centers are the place in Virginia, Maryland, and the Carolinas for dependable auto service and the best deals on tires. Its 55 locations are part of the Monro family of tire and automotive service stores. CouponSurfer Rewards members get 7% cash back in-store. Just Click to Activate Offer. Find a Treadquarters Service Center near you.